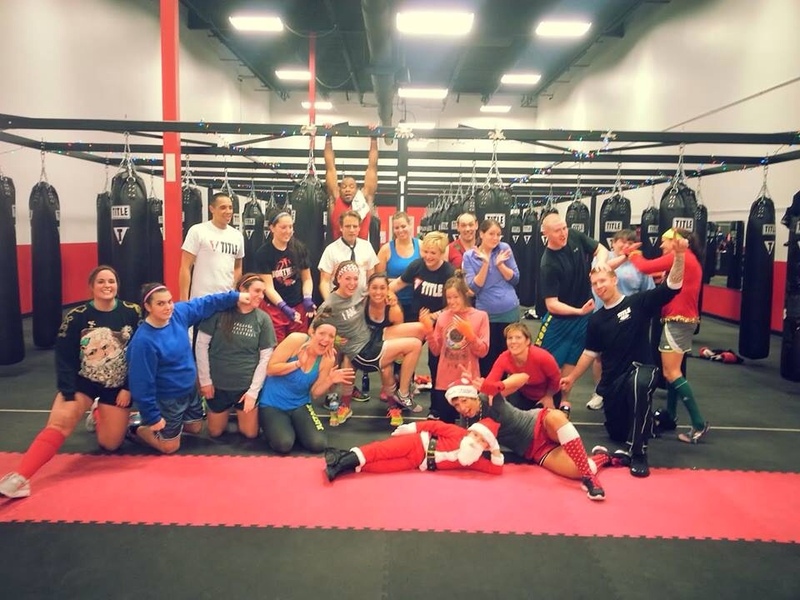 Have been kicking and hitting it the last month or so with TITLEBoxing in West Omaha (Oakview mall). Literally on the kicking and hitting in terms of workouts. Helping a bit on the business side too. The core workout mixes boxing and / or kickboxing over 8 rounds (4 minutes each). It’s a perfect program for metabolic, body strength building. Warm up and cool downs of 15 minutes bracket the core workout – hitting core, abs, lateral and vertical movements. The pace and fun of learning how to hit well, then applying those skills makes the time fly. It’s a blast! Hammer strikes, elbows, knees and other nasties. Check it out! It’s a solid stand alone program and hits enough body, rotational and skill development for a killer marathon / triathlon cross training workout. 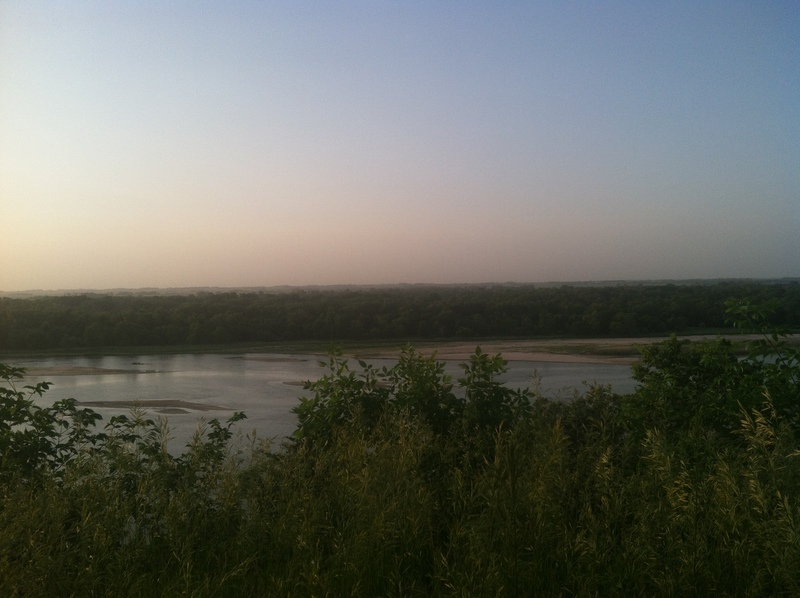 Platte River – from Camp Cedars! Three Weeks of hybrid workouts. The Run Less, Run Faster is still a guide, but will kick in fully in August (after Pikes Peak Double) and in time for a November 2 marathon (Indy)! It’s also allowed some flexibility – such as hiking around Camp Cedars (above pic) with my son Joshua during family day at his Boy Scout camp. The philosophy of 3 quality runs is locked in for me – Tuesday, Thursday and Friday. Also blending in quite a bit more biking, renewed swimming and 2 or 3 quality strength workouts a week. The mix feels right. Had a good 5k on Father’s Day (with my happy four legged running friend Heidi) at 22:49. Added some time due to poop pickup and extra time at water stops; shaved just a bit due to her help up a hill or two! Keeping the average workout time to 6 – 7 hours. Not ultra volume, but about an hour more than average from January to May. The last sixteen weeks have included an intense cycle of swimming (Jan-Mar) and CrossFit (Jan-end of April). Time spent for those two almost equals running time. Of 92 hours working out since the glistening on a new year, 50 were spent on something other than running. Additionally about an 1/8th of Lincoln Marathon preparation has been spent on other activities – rowing, cycling, hiking (snow shoveling and camping) and walking. CrossFit Games 13.5 – Fran, yet even nastier than her normal bad self! Tomorrow is the moment of truth. This sixteen weeks has been most similar to my 2011 Lincoln Marathon preparation. 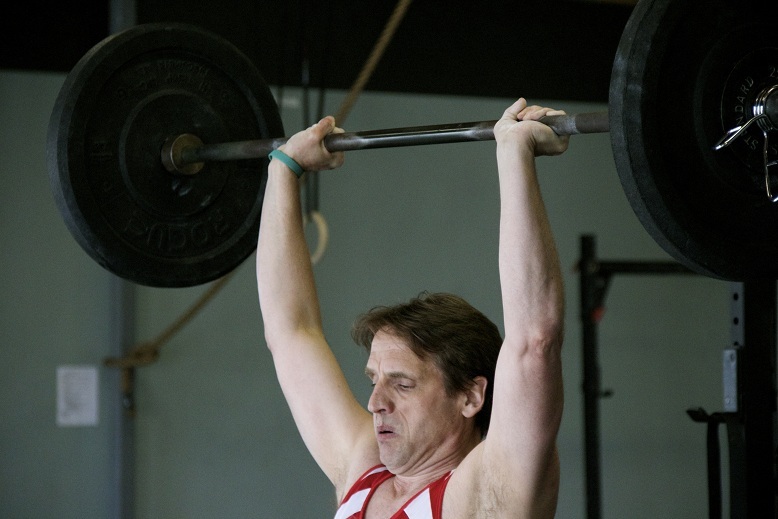 Differences this time – more strength training (CrossFit Starting Strength and WODs for CrossFit Games Open) and less speed work on the track (Spring that was more like a Winter!). I hope the results are similar to 2011’s 4:00:16, maybe even a shade faster! The Lincoln Marathon was ten days ago – May 1st – so was I too beat up to write a blog post? Nah, just busy, really. :-). Chart your marathon progress - you can do it! I’ll call this my marathon PR – 4:00:17 by the chip. I’m still 4 minutes off my 1996 all time best – but after my PR article a few weeks ago – am comfortable calling this the new PR (out of 21 marathons). I’m also just a sliver under 30 minutes from a Boston Qualifier time for a 45-49 year old male – this changes in 2013. There are two things that I think might be helpful to share – the race day experience (with weeks leading up to it) and trends over last two and half years – aka shaving 50 minutes off a marathon time! In early March I focused on some high intensity strength training and metabolic conditioning. The two together help push your anaerobic threshold and strengthen those weak areas that play havoc on a marathon (hips, glutes, hamstrings). I think I had a good balance of run/bike/swim/row and the CrossFit WODs (workouts of the day) . Had a great 20 miler in mid March, PR on a 10 mile run. 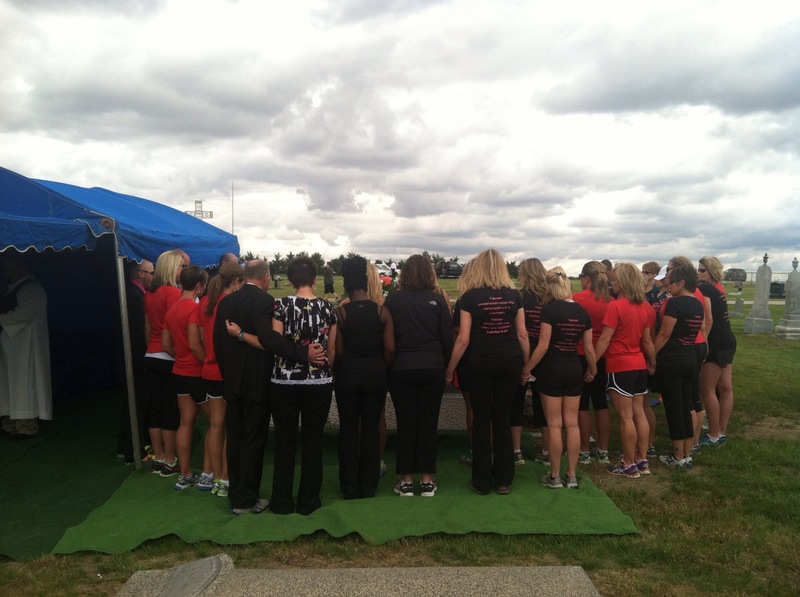 I also followed the CrossFit Endurance aerobic WOD’s closely. 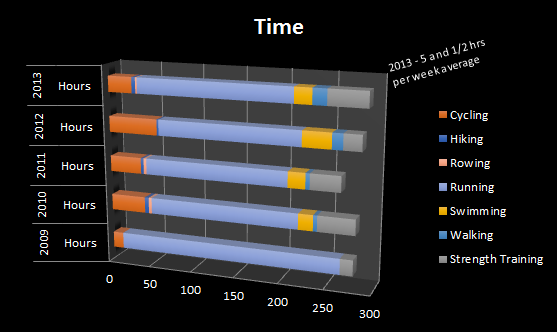 I tapered a bit in April – no Olympic lifting the week before the marathon, mixed in more bike and swim. I do think another 15 to 20 mile run would have been wise 2-3 weeks prior. All in all felt ready. Had a good strategy for Lincoln. Find the 3:50 pace group and hang with them. 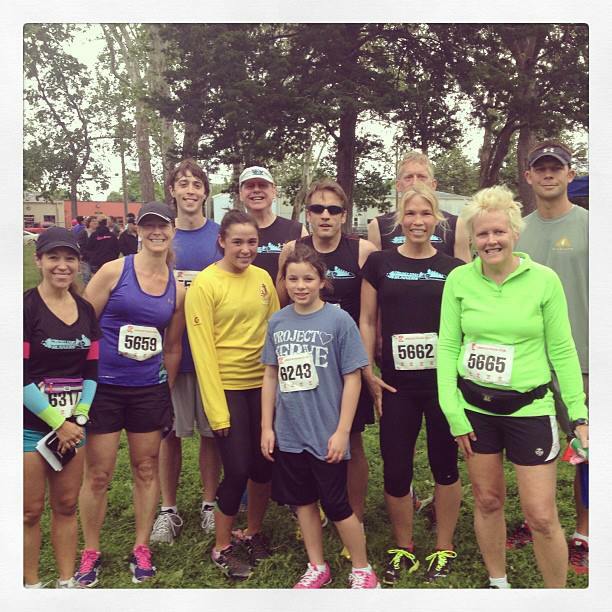 The first two miles were slower – 9:40 to 9:10. The idea is to avoid glycogen depletion early on – smart idea! Got ahead of the pace group and helped pace a friend to his sub 1:50 1/2 (way to go Dan-O!). Probably not wisest thing on my part. Caught back with 3:50 and ran among them until about mile 14. 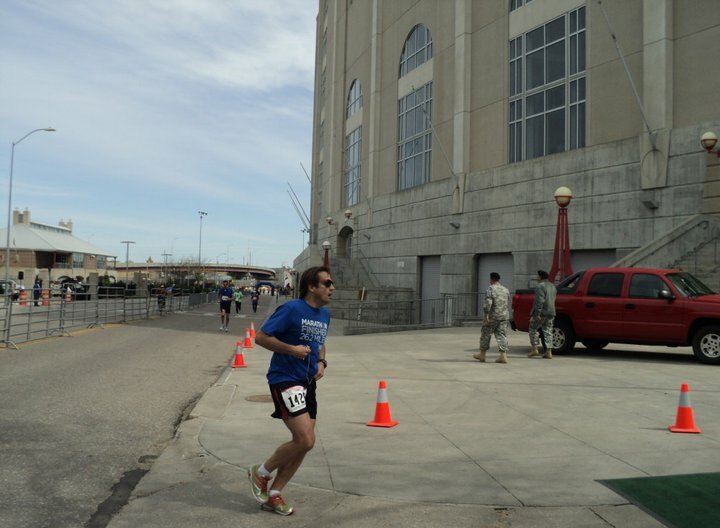 Times for the 10, 15k and 1/2 were slightly slower than 2010 Lincoln Marathon and Tulsa. Wasn’t feeling all that “chipper” from mile 12- 16. Was worried maybe the strong CrossFit WOD emphasis may have come at the cost of good endurance prep. Felt less confident than on my best longer run in March (20 miles at an 8:58 pace). Started feeling good again at mile 18 going into Holmes Lake – seeing friends along the way helped (shout out to Andi, Nelson, Jeanne and Barb). Seeing my family, including a very miffed dog in Heidi, who attempted to break free and join me while howling at me to pick it up, was great at mile 19.5! Much like the Tulsa Marathon, felt strong from mile 20 in. A couple of pit stops helped. No miles slower than 10 minutes (one right at it for a mile 20.5 pit stop). Picked the pace up from mile 21 on and held it. Was doing all I could from mile 24 in to bust through 4:00 hours. The Garmin time and splits looked good, yet, I know the Garmin distance is typically 200 – 400 meters longer than the 26.2. Some of that is due to large crowds and weaving across streets. Was on the 4:02 border at mile 25 but kicked in (well relative term) final mile at 8:45 range for final 1.2. Though it wasn’t 3:45 (or 3:30) was content with the results. I may never notch Boston but can take comfort in marathoning at a pace that’s closer to my expectations. Plus, much like after Tulsa, my DOMs (delayed onset muscle soreness) is much less. There’s nothing like riding a bike, walking, lifting the day after a marathon with just minor discomfort. As the table above shares – I’ve been able to improve the marathon times. Bluntly put it sucked. I was ready to punt any notion of another marathon after the Twin Cities in October 2008. The time was not my worst (4 hours 50 minutes) but the experience and results were not close to what I wanted. I figured maybe one or two more shots, but drifting into the 5 hour range was not on my radar – 16 marathons – was enough to prove to myself I could finish one. 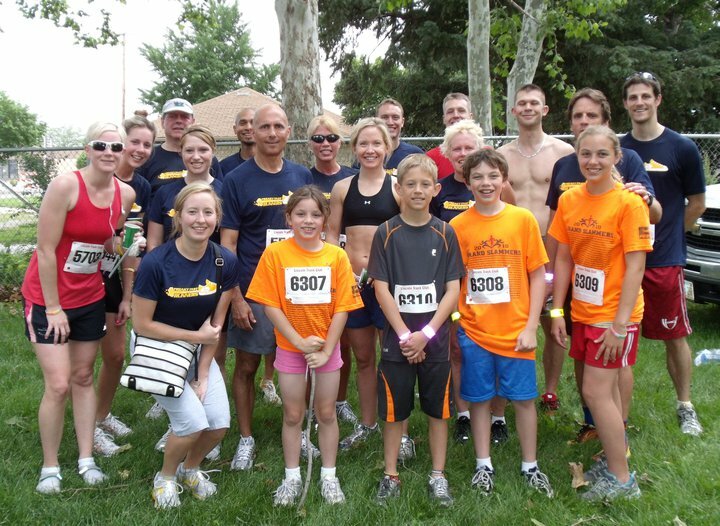 To reverse the tend I focused on higher volume aerobic, 85% running, from November 2008 to the May 2009 Lincoln Marathon. Some improvement there (27 minutes) but still felt like junk from mile 20 in. So I foolishly signed up for the Pikes Peak Double (40 miles, 2 days, all the mountain air you could hope for). I achieved a PR on the Ascent (4:43) and held together for the full marathon the day after. It’s still my overall best aerobic performance. Some nice PR 1/2 marathons followed and then “ping” on mile 9 of the Omaha 1/2 felt my sartorius muscle (groin area) in my left side scream out. 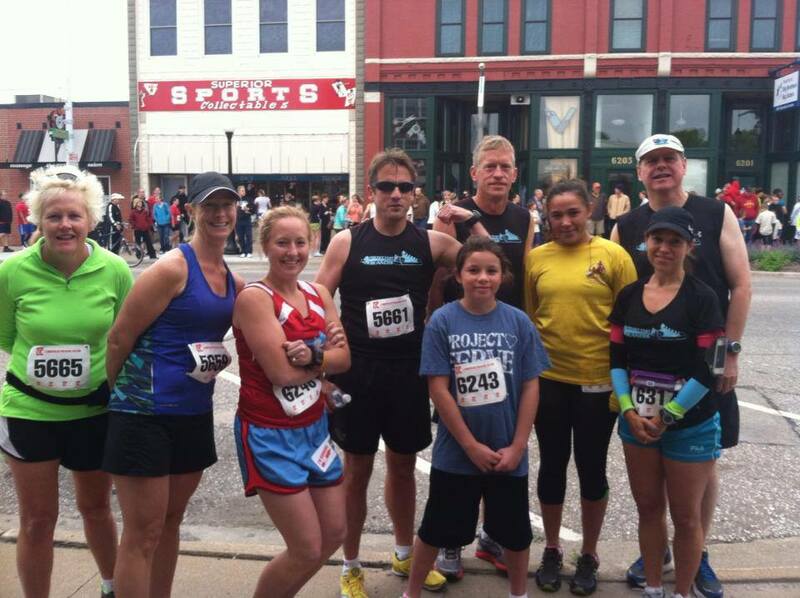 Hobbled and rested 3 weeks then hobbled through the Des Moines Marathon. That was a little faster than Lincoln and was just happy to get it done. That led to the “get fit and get strong” – so 90 days of P90x and then a year plus of CrossFit began. Saw good results in 2010 – close to PR times – 4:18 in Lincoln, able to recover and do an OK marathon 13 days later at Brookings (4:23) then good close to 2010 at Tulsa with a 4:07. More importantly than the time at Tulsa was how I felt after mile 19. The normal “wall’ish” feelings started hitting me around mile 17. Surprisingly after some salty pretzels and a little stretching felt great from mile 21 in. I had never felt that good on a back 6 (where the marathon really begins, at mile 20). 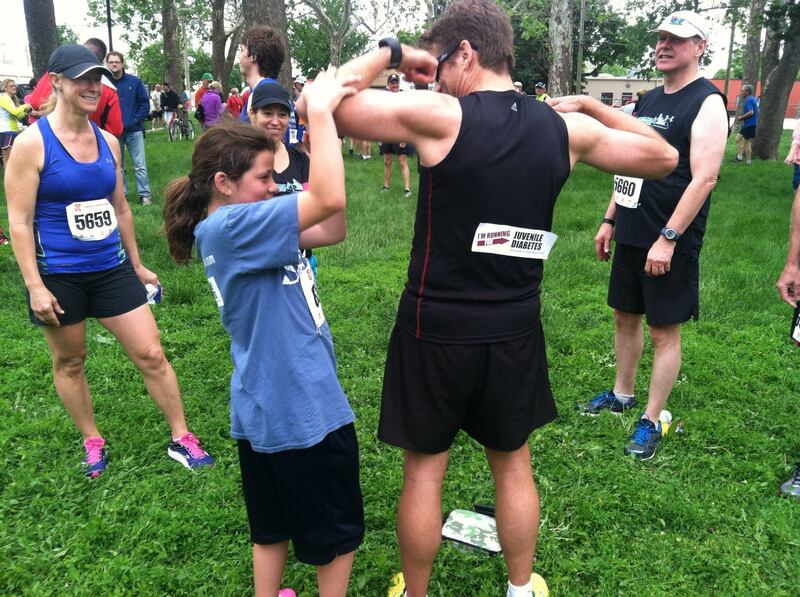 Shaving another 7 minutes at this year’s Lincoln Marathon was satisfying. I was targeting a 3:45 to 4 hour event – and came in on the slower side. Still it was another strong day and finish. Though running the front 1/2, 2 minutes slower than a year ago, I was able to finish 18 minutes faster. Will follow same game plan for a return visit to the Pike Peak Double and one to two Fall marathons. Time to bust through the 4 hour door and say hello to sub 3:50. Then shave more time in the 2012 Lincoln Marathon. I’ll continue with 4 running workouts a week – inching upward the volume to 26-30 miles per week. I won’t sacrifice speed/stamina/ strength or flexibility. How far back for a PR to be a PR? PRs drive me - how about you? The PR: Personal Best, Personal Record (PR) – in swim/bike/run/row/adventure race/CrossFit worlds a PR is about your victory over yourself. Whether you’re a back of the pack, middle of the pack or top dog – it doesn’t matter. PR’s are celebrated by friends and competitors alike. 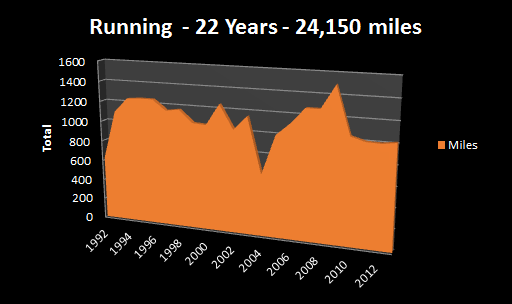 1/2 Marathon – 12 year best 1:44:30 (Grand Island in August of 2009) all time best 1:41:17 (Lincoln 1997). 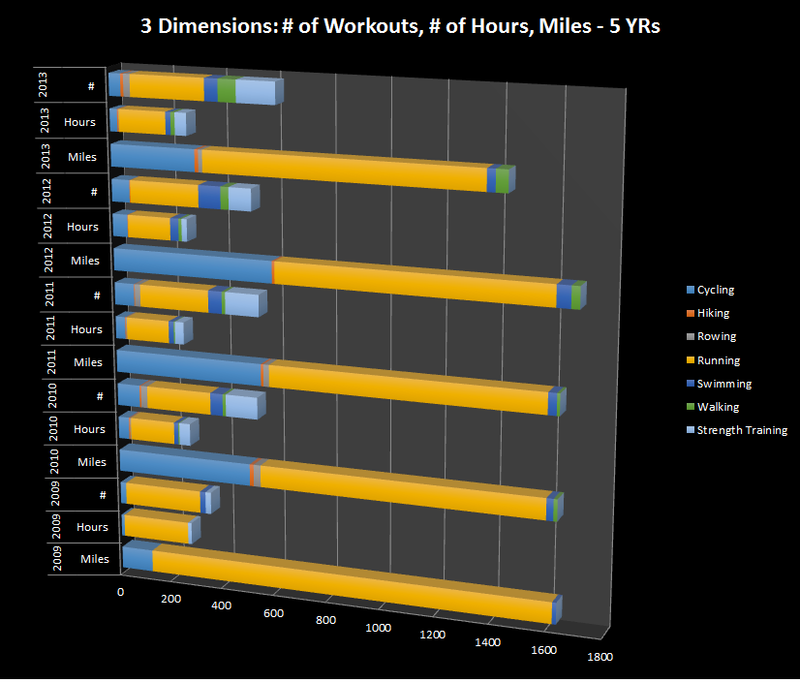 I want to measure this again this year and see impact of Strength / Anaerobic Training begun in October of 2009. 5k – 12 year best 22:49 (front half of Novartis 10k, March 2011), all time best 20:59/ 20:32 (6:45 pace, Bun Run in 1996 and 6:41 pace Public Safety 5k – Omaha – 1996). 1 Mile – 5:59 (Lincoln Mile, 1998), foggy memory of a 5:18 in High School in practice in 1981… but that was a little while ago. Fran – 75# – 7 minutes 12 seconds. This can also be applied to weight, body fat, annual physical results (cholesterol, triglycerides, etc). Right now my racing weight is at 168-170lbs. Two years ago before the Lincoln Marathon I was at 183lbs with a nice little marathoner’s belly that men pile on over the years. My weight was slightly lower at the Tulsa Marathon (164). One change has been been continued Paleo Nutrition moves (higher protein, animal fat) and heavy strength training cycle from February to early April). What PR’s do you keep? What value to you see in them? I see them not as a wall to bash your head against – but a meaningful measurement to see what your current state is. And whether you’re an age group winner, trophy sniffer (almost to that age group winner, or where I’m at now), mid pack or back of the pack – it doesn’t matter. PR’s are all about you! They also can help motivate you when your workouts are hard, progress slips or motivation wanes! 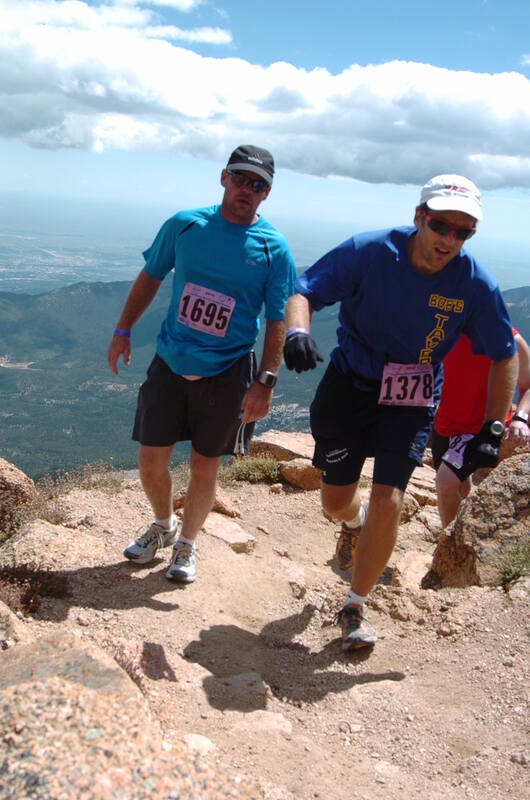 I have a few more opportunities over the next several months to test this out – the Lincoln Marathon next Sunday, Cornhusker State Games in July and Pikes Peak Double (great comparison to my age 40’s peak of endurance/aerobic fitness in August of 2009).